Lecture Series Continues! Kim Copel-Harris Chautauqua Performance as “Lillian Virgin Finnegan” SOLD OUT! We are all Sold Out Tonight!! So Sorry! Dinner starts at 5:30 p.m. and lecture starts at 7:00 p.m.
Lillian was a Genoa, NV woman who was not only a suffragette in the 1900’s, but she was responsible for originating the locally famous Genoa Candy Dance Festival, which is now in it’s 98th consecutive year. She also worked closely with Governor Emmett Boyle during his term in office. In 2019 a statue will be erected in the Town of Genoa in her honor. 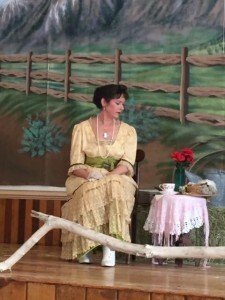 Kim is a Historian, Chautauquan and Character Actress. Her love of history is primarily “American Western History” and she enjoy presenting it in fun and exciting ways. A resident of Genoa, NV and a longtime local to the surrounding Sierra Nevada communities. She has served on the advisory boards of both the Lake Tahoe Historical Society and the Douglas County Historical Society. She currently serves on the advisory board of the Nevada division of the National Pony Express Association. Come early and enjoy dinner before the lecture! We Serve dinner from 4 to 8 p.m.
Easter Sunday Brunch at the Gold Hill Hotel! Sorry, sold out for this event! !